Hello hello! I'm back with another What I Ate In A Day post, which I've been sharing with you every Tuesday (you can check out last weeks' post here)! I follow a vegan diet/lifestyle, so all of the foods that I'll be showing you today are meat, dairy, and egg free. As always, I drink a ton of water throughout the day! I've been making banana muffins for years and years, and I have to say that my recipe is pretty fantastic! I had the last two muffins from the batch for breakfast, but I would have had a third if I could! I also had a glass of Silk's Dark Chocolate Almond Milk, because it's just oh so good! My husband made me lunch, and he boiled a sweet potato and cooked up some of Gardein's Chipotle Lime Crispy Fingers. I mixed up some of Hellmann's vegan mayo and ketchup to dip the Gardein fingers into. This was actually my first time eating a boiled sweet potato and I'm obsessed! I normally bake or deep fry sweet potatoes, but I really loved how creamy the boiled version was. Throughout the afternoon I snacked on some fruit, as I usually do. I had an Asian Pear and an apple, which held me over until dinner! We ate out for dinner, as we went to see Bill Burr's comedy show at the TD Place. Panago Pizza is not far from the stadium, and I've heard that they offer vegan options! In fact, they had a sheet at the cash that listed all of their vegan options! 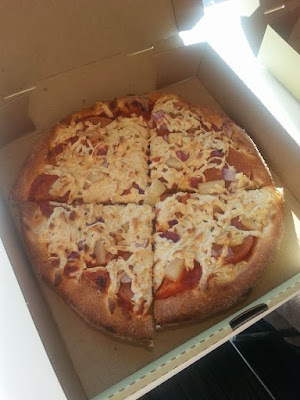 I ordered a personal pizza with onions, pineapple, meatless pepperoni, and Daiya cheeze! The crust was so delicious and chewy (I personally prefer thicker crust on my pizza! ), and they definitely didn't skimp on the cheeze. We'll definitely be going back, as it's right across the street from my husband's favourite theatre, the Mayfair. Well there you have it! Another documented day of vegan eating! I hope you've gotten some food inspiration from this post, or at least some kind of idea of what a typical vegan eats in a normal day. Remember to check back next Tuesday for another What I Ate In A Day post! I didn't know that Panago had vegan options!! Super exciting! Ya, I was super excited when I first found out about their vegan pizzas!